Van der Werff (1659-1722). French and Italian influences become important in this time period, as can be seen in his paintings. Van Ostade (1610-1685). He became a fellow pupil with the Flemish painter Brouwer in the Frans Hals studio. His pictures are mostly taken from ordinary peasant life. Caspar Netscher (1639-1684) became popular as a painter of the higher classes. He was a pupil of the painter Terborch. Cornelis Troost (1697-1750) was the last genre painter. Colours are bright, but his pictures leaves much to be desired. His paintings gives, however, a clear insight of 18th century. Frans van Mieris (1635-1681) was a pupil of the painter Dou. His works are generally small sized; the subjects, taken from everyday life, displaying great perception of character. Gabriel Metsu (1630-1667) was a pupil of Rembrandt van Rijn. His work shows him to have been an impressionable character. He was born in the city of Leyden. Gerard Dou (1613-1675) was a pupil of Rembrandt. The pictures of his tiny masterpieces and the exquisite finish of their details completely captivated the taste of the public at that time. Gerard Terborch (1617-1681) was born in Zwolle in a wealthy family. Terborch painted mostly the elegant manners of the upper class. Jan Steen (1626-1679), with Hals and Ruisdael, is one of the three who fills the gap below Rembrandt's supremacy. Steen painted mostly plain people and how they lived. Johannes Vermeer (1632-1675) was born in the city of Delft. He is original in the manner in his paintings in which he used a diffused light. Nicolaes Maes (1632-1693). The portraits he executed in his later years are excellent, but he shows himself at his best in his earlier work, after he left his master Rembrandt. Pieter de Hooch (1630-1677) can be ranked with Maes and Vermeer. His paintings introduced a different light effect through open doors and windows. Genre is the painting of the familiar life of the people, without preponderance of the figure, the background being of equal importance. It is not the mere story-telling picture, but must also display the artist's feeling of colour and light. The Dutch were not the originators of this style of painting, the Venetian Bassani and Carpaccio had led the way, but the Dutch artists of the 17th century gave this kind of art-expression definite rank and importance. It appealed to them. They had little interest in mystic or epic art. They were too hard-headed and practical. Weary of war, hate and fanaticism, they turned from bitter controversies concerning dogma, from all the ensuing dreariness and desolation of those troublous times of strife and enmity, to the peaceful scenes of home life, so dear to them. The love of home became almost a religion to the Dutch, and their great painters of homely life were its prophets. The Dutch genre painters depicted their social history with a fine eye for the broad, permanent forces of society. Nor need they be accused of preference for low life and a coarse display of vulgarity. The Hollanders are a frank people, and a clean people, which saves them from senseless prudery or severe convention, whereby, even in what is apparently common, they cannot be denied moral dignity through their grasp of character and winning frankness. Whether they turn up the seamy side of life, as Jan Steen, or the fashionable upper classes as Terborch, they give a revelation of character expression which never becomes trivial. The painters of genre in this century have often been called the "little masters." This must not be supposed as being a distinction of artistic greatness in comparison with Rembrandt or Hals. 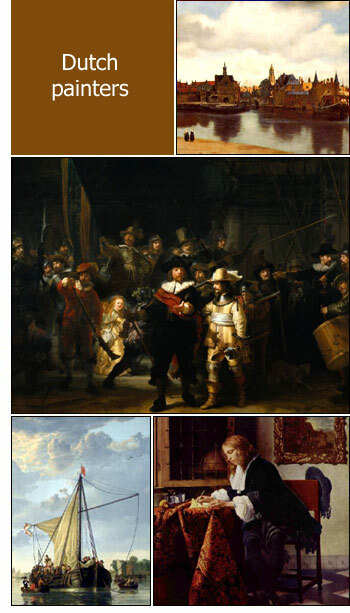 Far be it not to rank the work of men like Ostade, Vermeer van Delft, Dou, Terborch, and the others among the foremost treasures of this golden age. The appellation has been given them through a misconception of the use of this term in Holland. There it referred originally to the size of their paintings, to their "little masterpieces," and by transition to the artists who painted these. They were masters, "great" masters, painting in "little".